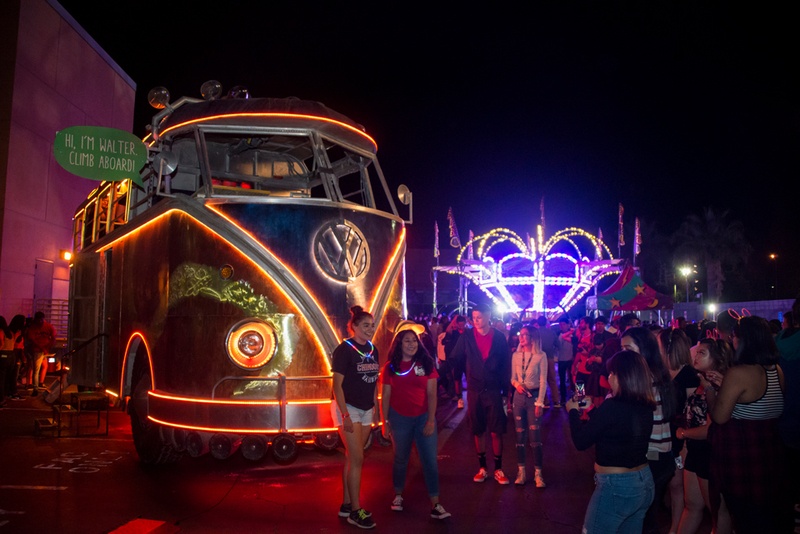 Walter the Bus, "the World's Largest Volkswagen Bus," visited​ Matador Nights on Sept. 14. Photo by David J. Hawkins. Popular DJs LA Leakers returned to Matador Nights to keep Matadors dancing all night long. Photo by David J. Hawkins. 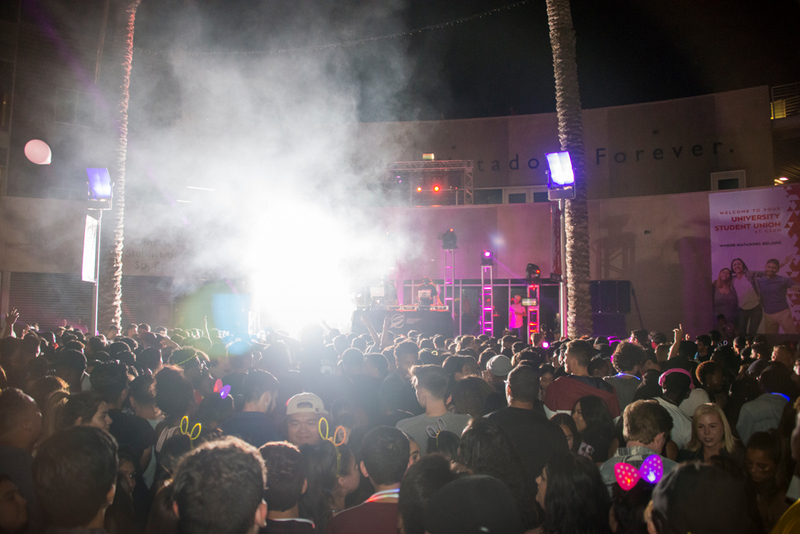 Students filled the University Student Union for a night of music, food and fun at Matador Nights. Photo by David J. Hawkins. No Matador Nights is complete without Matty the Matador's dance moves. Photo by David J. Hawkins. 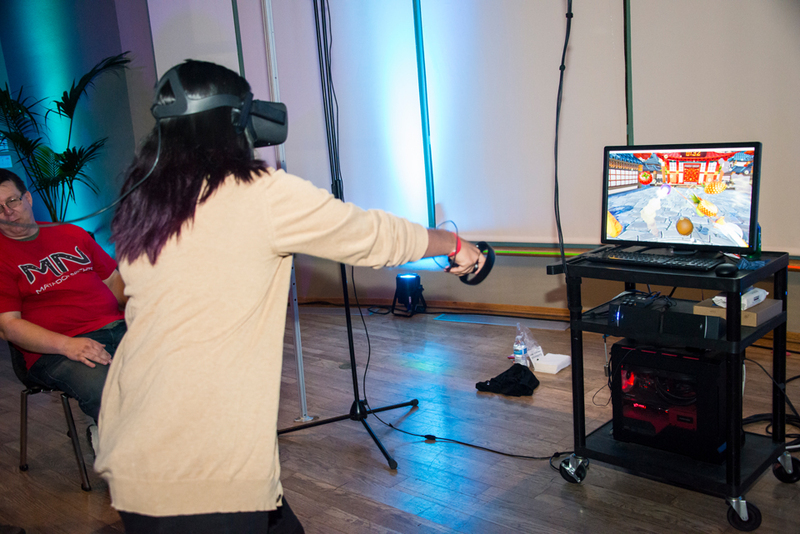 The classic arcade with a twist: students could try out virtual reality games in the arcade during Matador Nights. Photo by David J. Hawkins. Matty the Matador stopped by the USU Grand Salon arcade for some air hockey coaching during the fall 2018 Matador Nights. Photo by David J. Hawkins. 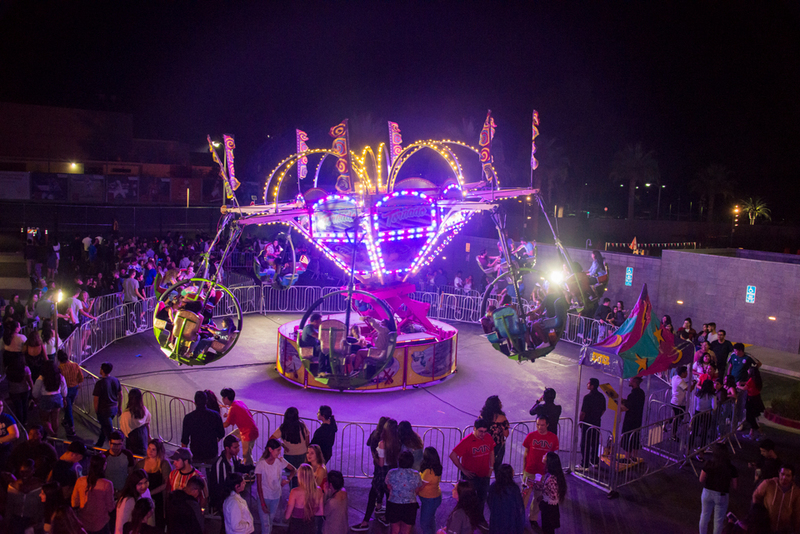 The Tornado took Matadors on a dizzy ride at Matador Nights. Photo by David J. Hawkins. 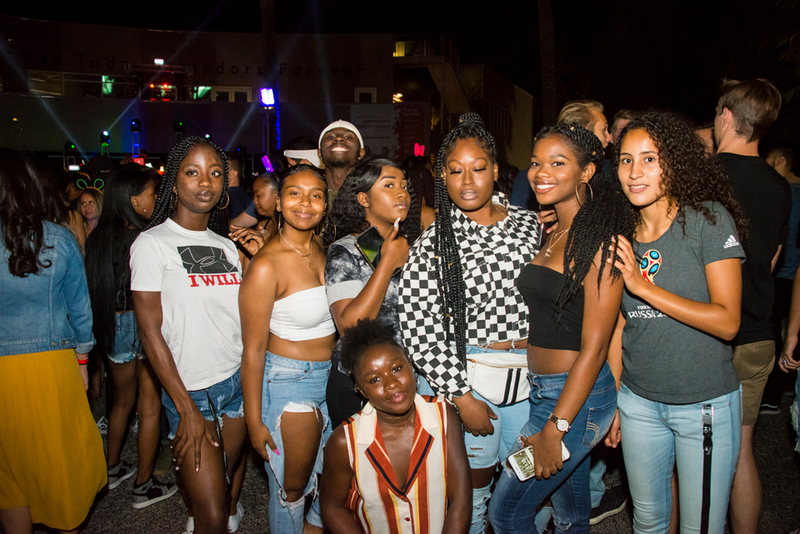 University Student Union's Plaza del Sol was transformed into a bustling dance floor for Matador Nights. Photo by David J. Hawkins. 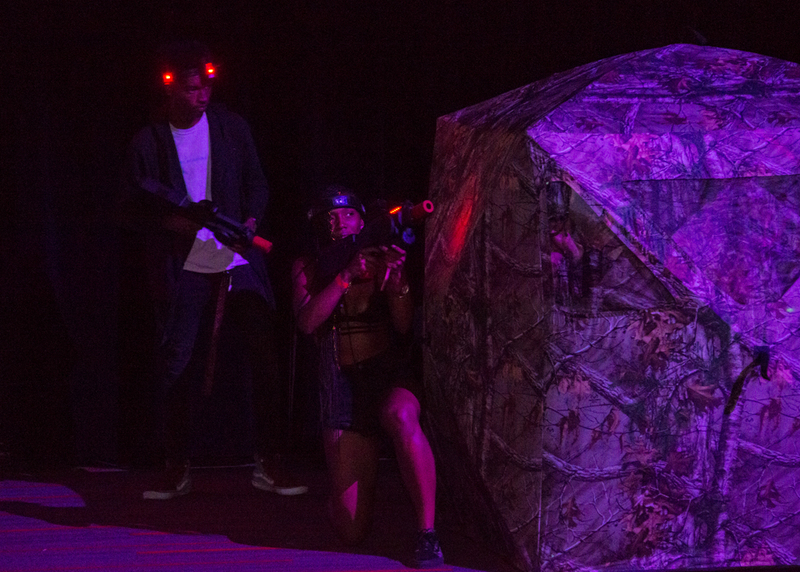 Students entered the laser battlefield in the Northridge Center to challenge fellow Matadors to a game of laser tag. Photo by David J. Hawkins. 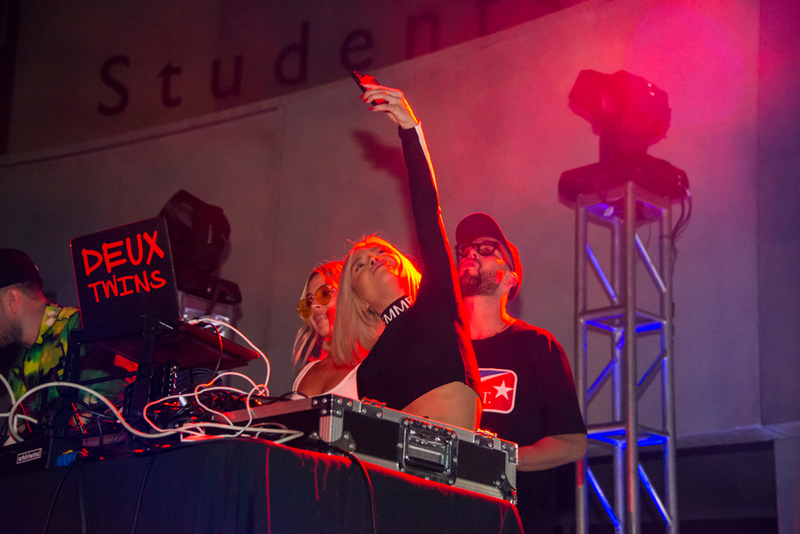 DJ duo Deux Twins got the party started at Matador Nights on Sept. 14. Photo by David J. Hawkins. Celebratory cake was served in honor of the University Student Union's 30th year of events. Photo by David J. Hawkins. 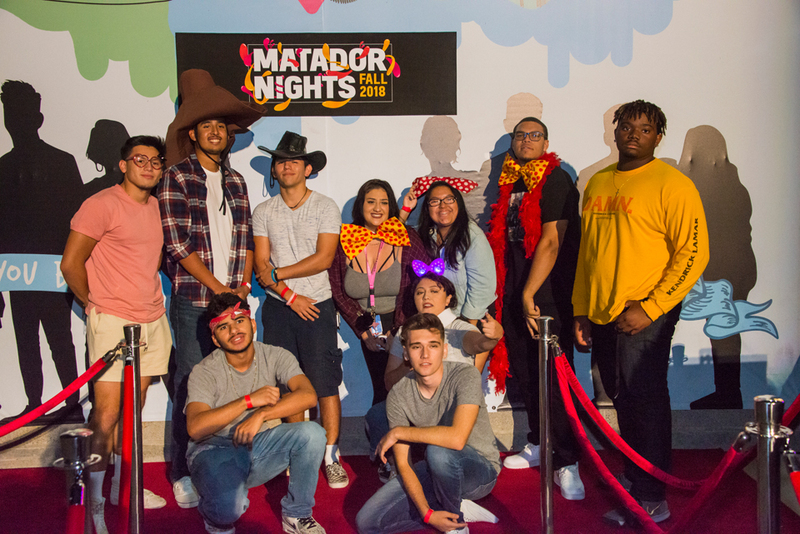 Matador Nights kicked off the fall 2018 semester on Sept. 14. Photo by David J. Hawkins. 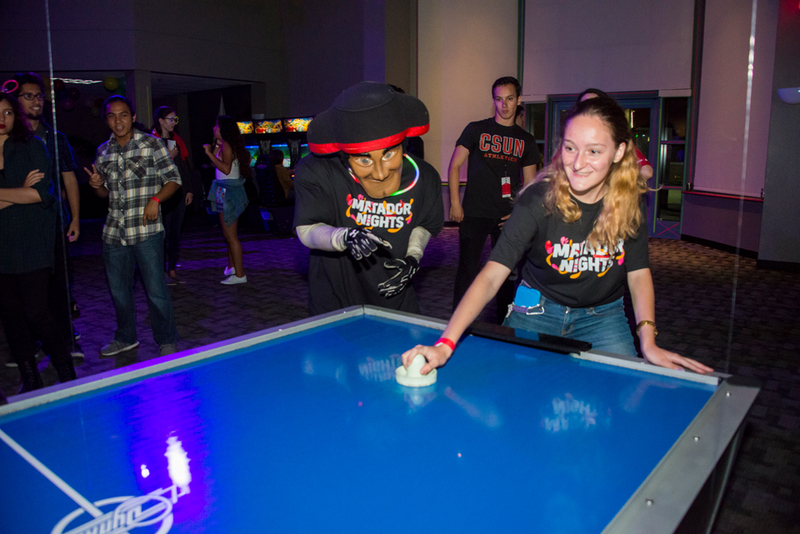 The University Student Union's Grand Salon turned into an arcade with classic games for Matador Nights. Photo by David J. Hawkins. 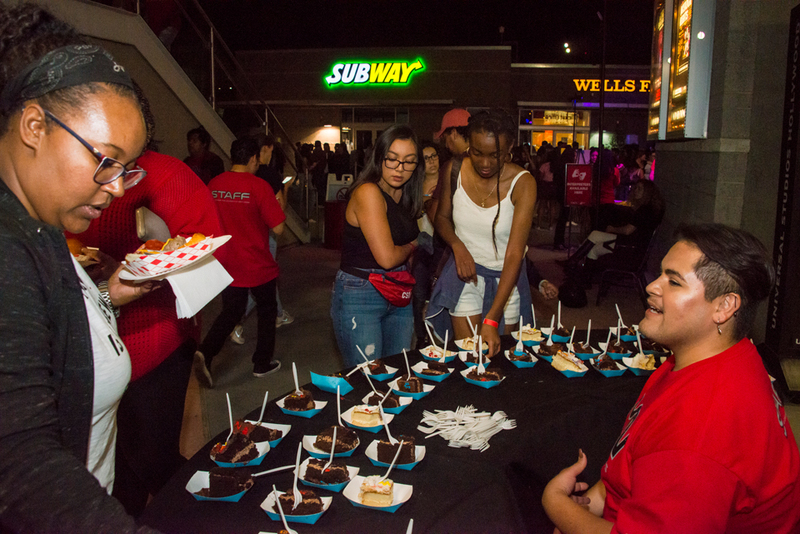 The fall 2018 semester at California State University, Northridge got off to a thrilling start as students took a break from their new class schedules to join fellow Matadors at Matador Nights on Sept. 14. 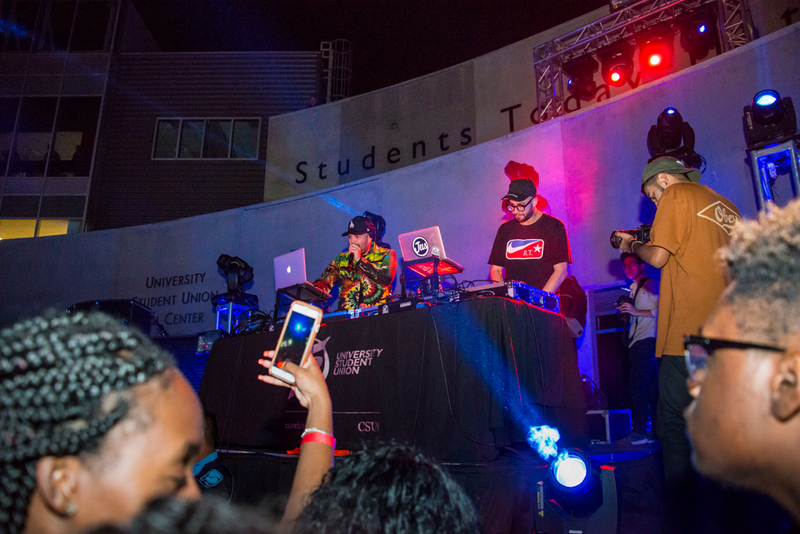 Every semester, CSUN’s University Student Union (USU) transforms into what the USU calls “CSUN’s Best Party.” This semester, Matadors filled the USU to enjoy games, live DJs, food and fun. Students had the chance to challenge their friends to a game of laser tag in the Northridge Room, which was transformed into a laser battlefield where teams of Matadors battled for victory. 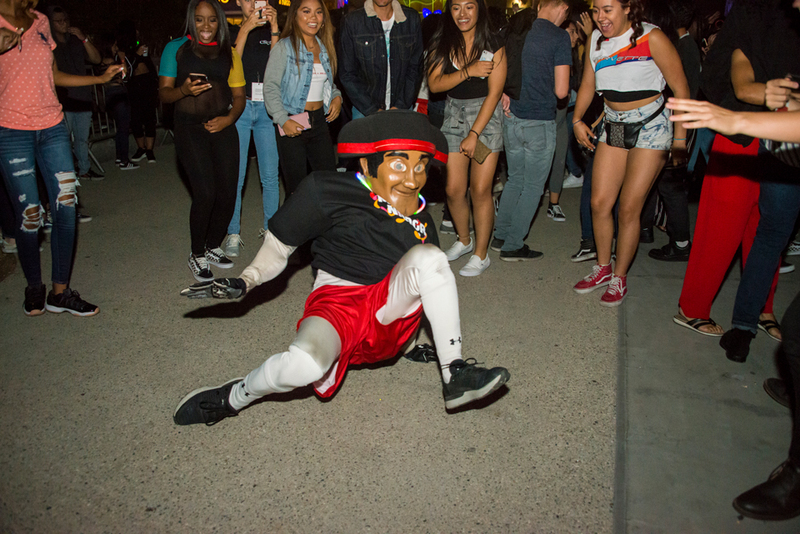 Free pizza, sliders and popcorn helped keep students’ energy up, so they could (try to) keep up with Matty the Matador’s dance moves on the Plaza del Sol dance floor. DJ teams Deux Twins and LA Leakers kept the dance floor bustling and the party going until 1 a.m.
Walter the Bus, “the World’s Largest Volkswagen Bus,” visited CSUN for the night and offered a fun hangout spot and popular photo-op with its bright neon lights. Students looking for more action took a dizzy ride on the fast-spinning Tornado carnival ride. In the Cosmic Room, party-goers could get horoscope predictions for the upcoming semester or stop by for airbrush tattoos. 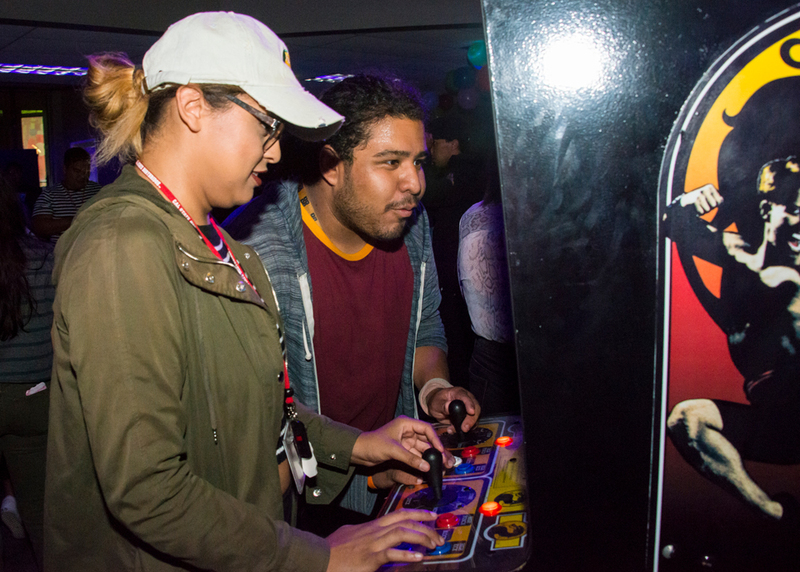 The USU Grand Salon was turned into an arcade with a modern twist, packed with classic arcade games as well as virtual-reality games. Transfer student and first-time Matador Nights attendee Klara Gadd said she came for the fun and free food. “I wanted to feel like a part of the school and see what CSUN has to offer, now that I’m a Matador,” Gadd said.